About: Hamleys Of London are world-famous and sell a vast range of toys, teddy bears, games and puzzles. Arguably the King of toy shops, stretched out over seven floors and all but guaranteeing to have something you want - whatever your age. If you are taking children be prepared, because you'll probably spend all day in there. 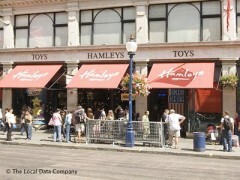 One of the world’s most famous, Hamleys is the king of London’s toyshops. Multiple floors of fun, toy testers and exotic, unheard of games make it a child’s paradise. Located on Regents Street, Hamleys is an experience; after all, it’s the world’s biggest toy store.